In an effort to reduce the distance between in the DC / Prince George’s County area and our urban farming colleagues in Baltimore, we packed into the pickup again and headed north on 95. This time, our destination was the Great Kids Farm, run by the Baltimore City Public School System. After getting off the highway, we were thrown head first into some of the ugliest sprawl: big box stores mixed with used car dealers, vacant buildings, and empty parking lots. But, after making that turn into the Bragg Nature Center, where the Great Kids Farm is, its a completely different world. You drive up past the goats, dodging the teams of volunteers while parking at buildings that was once a boarding school turned into a farm and food educational center. I immediately found Greg Strella, the farm manager, and he showed me around. They’ve got chickens and composting worms, tight fields filled with cover crop, old-school A-frame greenhouses and new hoop houses. Everywhere Greg took me, he stressed at what a mess this place was a few years ago, talking of dumpsters of debris that filled this now beautiful urban farm. And they’re doing a little bit of everything. They’ve got trays of tomatoes waiting to be planted, rows of kales and collards that made it through the winter, free range chickens, and trays upon trays of sprouts, ready for harvesting and selling to local restaurants. Like most farms, it seemed like organized chaos, Greg holding the reins of this place and going along for the ride. He’s got the great support from his co-workers and teams of volunteers. They’ve got an amazing rhythm that results in an exceptional educational facility, a very productive and profitable farm, and a sanctuary of saneness within miles of urban sprawl. Its a great opportunity to visit another urban farm, to teach them something that they might have not known and to leave with specific changes in how you’ll approach your farm back home. Many thanks to the staff of the Great Kids Farm for taking the time out so that we can learn from each other. Of course my camera battery was dead that day, so I don’t have any good pictures of my own. For pictures of the Great Kids Farm, check this out. Food Justice Friday- Food Deserts Real or Myth? We invite you to participate in our weekly twitter chat. This week we will discuss whether in the land of plenty food deserts are real or a myth. While the White House has tossed in their lot on the side of real, many researchers are not convinced. Bring your stories, examples and opinions at 3pm ET for a lively discussion! 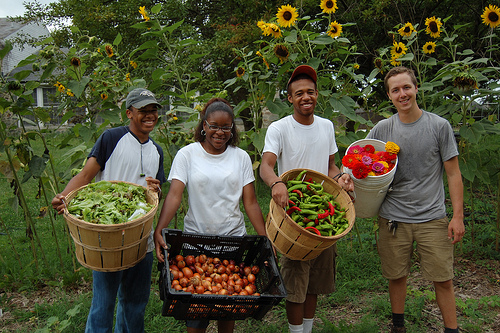 Follow @sowingseedsdc and talk back to us with #foodjustice. Thanks for participating, we are looking forward to a lively discussion! The State of Missouri House of Representatives passed an Urban Agriculture Task Force bill , enabling the state to create a specific task force to study urban agriculture in their state. Good job Missouri! Way to pull through. Something I’d expect from California or New England, but this underscores that urban agriculture isn’t another passing fad of left-leaning parts from our country, but being pushed forward by everyone from the coasts to our agricultural core. What would an Urban Agriculture Task Force do for our area? Would creating such a task force identify and break down barriers to urban agriculture in the Chesapeake region?